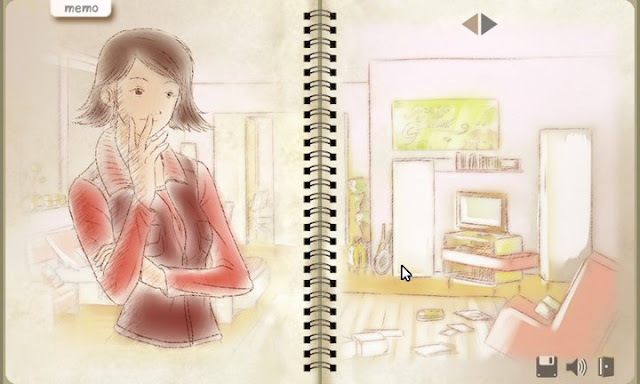 Grace's Diary is a "Serious Game" created by Hima in Bangkok, Thailand, in the form of a visual novel adventure, which was named the winner for the 2010 Life. Love. Game Design Challenge, an annual competition sponsored by the Jennifer Ann's Group to spread awareness about the dangers of teen dating violence. The story is about a student named Grace and her best friend Natalie, whom she thinks might be involved in an abusive relationship. In the game you must search for clues that convince Natalie to review her situation and seek professional help for her troubles before it is too late to act. 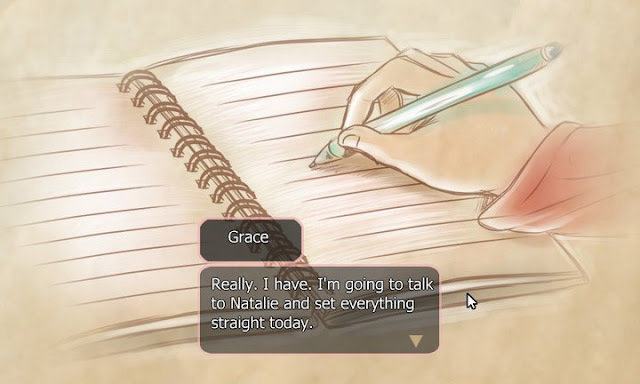 Grace's Diary manages to seamlessly integrate the theme of relationship abuse into a sensitive and moving visual novel. 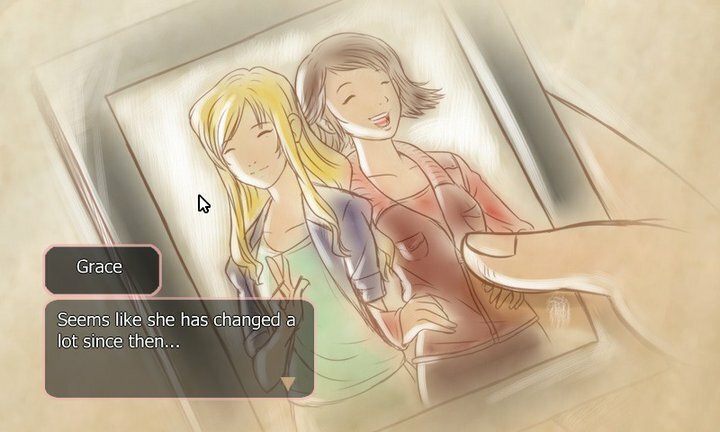 In the first part of the game, in classic point and click style, you click on various objects in Grace's bedroom to trigger memories about her friend Natalie. When you remember something important to tell Natalie, you write it down on your memo pad. Sometimes remembering something from one object can allow you to remember something from another object, so you have to click on objects more than once. Once you think you've remembered enough, you pick up your cell phone and call Natalie. Then, you click through a dialogue tree, sharing your memories with Natalie--if she'll hear you. There are two endings, so you may want to save before picking up that phone. The delicate, sketchy quality of the art and the restrained music quickly establish a sense of intimacy. It may seem like a minor challenge compared to escaping from a ghost or mad man in a horror game, but the very reality of the situation made it scary in a way that those games could never be. Most of us have known or will someday know a Natalie. How to intervene? Should we even try, or will we just make it worse? The biggest flaw in the game is that the dialogue is clearly written by a non-native speaker, and hasn't been properly edited. However, despite some awkwardness, some misspellings, and some grammar errors, the meaning is still easy to grasp, and perhaps more importantly, the emotions and personality of the characters come through clearly. Frequently, this kind of Serious Games title is so forced, the characters so flat and predictable, and the plot so clearly just checking off boxes on a government list, that only an assignment could force you to play it. 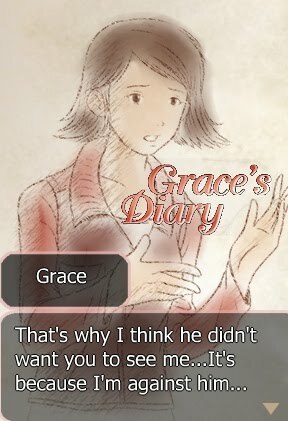 Grace's Diary doesn't try to force anything down the player's throat, nor does it allow "the message" to overpower its gameplay and plot. It's worth playing, not to "raise awareness" or to "learn the warning signs" or some other phrase that appears on a press release, but because the story of Grace's concern for Natalie, though sad and brief, is beautiful.